As a patron wandering through the usually air-conditioned, quiet hallways, sometimes it's easy to lose yourself in the world of art that surrounds you by taking for granted the fact that somebody actually took the time out to acquire, collect and hang the works found in your local museum. And while the art itself or the lives of those who created the masterpieces is often the biggest draw, it isn't too often that you find yourself taken in by the saga of the curator... largely in part because it isn't readily available for you to explore. Fortunately in this eye-opening award-winning documentary fresh off the film festival circuit, art enthusiasts and history buffs uncover that for unsung champion Igor Savitsky, the story of building the collection is both fascinating as well as integral to fully appreciating the works themselves. Additionally, because the now deceased Savitsky's renowned museum is situated in the Uzbekistan desert, it makes filmmakers Amanda Pope and Tchavdar Georgiev's extraordinary eighty minute portrait that much more vital. 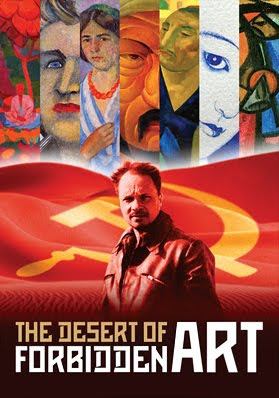 Namely, not only are most of us minus the means to undertake such an excursion but also because Savitsky's collection and plight offers new insight and understanding into the history of the former Soviet Union following the revolution in the early twentieth century, their venture The Desert of Forbidden Art can therefore be appreciated on a more global level. Essentially the Oskar Schindler of Soviet artwork, after aspiring artist Igor Savitsky received overwhelmingly pessimistic and negative feedback about his paintings from one of Russia's most revered artists, Igor Savitsky focused his creative energy on celebrating the work of others by eventually rescuing more than 40,000 forbidden or hidden pieces of art during his lifetime. Although he initially tracked down beautiful folk art criticized by the Communist party, eventually Savitsky sought out the breathtakingly colorful brushstrokes captured on canvases by daring artists sent to the Gulag or mental institutions because they didn't fit in with the socialist Soviet realsim style that romanticized workers and leaders. Brilliantly but dangerously acquiring government funding to amass a staggering collection of items that had been banned by the state, Savitsky benefited immensely from his shrewd decision to build his museum in the middle of nowhere. Thus hidden from the overly watchful eyes of the KGB, Savitsky made more than twenty trips journeying seventeen hundred miles to develop a collection so large that to this day not everything can be displayed yet nothing will be sold since culture continually usurps commercial interests for those in charge. In bringing the story of Savitsky, Uzbekistan painters and craftsman as well as the area to life, the filmmakers make great use of archival footage, photographs and the art in question and balancing it out with extensive video clips of interviews conducted with the children of artists, friends, relatives and colleagues along with voice over narration from Ed Asner, Sally Field and Ben Kingsley. Nonetheless, there are a few times in the first half of the documentary where it seems like it's jumping all over the place in struggling to maintain a fluid balance and natural transition between the political, artistic and personal realms of its subject matter. Yet over all it's an extremely impressive piece of work that is sure to make you curious to learn more about some of the individuals whose colorful canvases nearly jump off the screen. Moreover, it inspires you to think about the effort, sleuthing and passion that exists outside the frames as curators like Savitsky put their lives on the line in the pursuit to showcase art that breaks down barriers and gives a voice to all regardless of language barrier, life/death, or geographic location by reminding us that creative freedom must be celebrated at all costs.